Fox Racing 360 Houston Victory Jersey Now Shipping! dye-sublimated meaning that they won't fade from washing. The pants are a polyester construction featuring strategic laser perforation for high levels of comfort in active MX riding scenarios. They feature a pre-curved RAP construction for ideal ergonomics in the riding position, and the quad-stretch panel in the crotch allows uninhibited movement on the dirtbike. The knees feature articulated stretch panels that allow for movement over top of protectors, while the double layer fabric in the knees feature an abrasion resistant interior material with abrasion and heat resistant leather on the outside. TPR logos at the knees and thighs are also vented for added airflow. 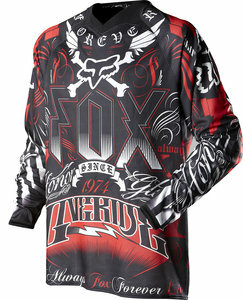 If you want what the pros wear, the Fox Racing 360 Houston Victory set up is right up your alley.